Total knee replacements are being done around the world all day every day. With the Baby Boomer population finally entering their retirement years, the surgeries to repair aging bodies are happening in every country on the planet. Of course, no one really WANTS to have surgery, but joints that are worn out cause a lot of pain and create a major impairment to a happy and comfortable retirement. Just as we finally have the time to start enjoying every single day, travel, vacation, and play with the grandchildren, our bodies start falling apart! It’s not fair, is it? But there are lots of ways to make this procedure more tolerable, safer, and improve surgical outcomes, all in a perfectly natural way! The method that you can now utilize and benefit from now is the use of scientifically chosen and sequenced classical piano music that calms, soothes, and stabilizes vital signs through a process called rhythmic entrainment. This process was discovered hundreds of years ago, but thanks to modern technology, this music has been pre-loaded into lightweight, cordless headphones and they are being used in hospitals and dental clinics around the world! Are YOU having knee replacement or hip replacement surgery? Or any painful or anxiety-producing surgery at all? If so, you might consider getting the Surgical Serenity Headphones, already loaded with our beautiful, chosen for surgery music!! 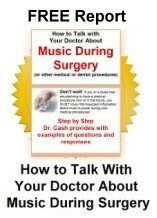 Just go to www.SurgicalSerenitySolutions.com. Another first-person account of music during surgery!